Some of the companies discussed in this report include: 3M, Asahi Glass, BASF, Chromogenics, DuPont, Eastman Chemical/Solutia, GE, Gentex, Guardian Industries, Hitachi, NSG, Pleotint, PPG, Research Frontiers, Sage, Saint-Gobain, Scienstry, Southwall, Solvay, Suntek, SWITCH Materials, Toray, US e-Chromics, and View. Electrochromic smart windows (including glass and film) will reach $622 million by 2019 making electrochromics the largest segment of the entire smart windows business. 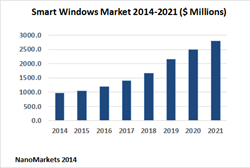 According to a new study by the industry analyst firm NanoMarkets – “Smart Windows Markets: 2014-2021” -- revenues from smart windows will reach $766 million by 2019 and then ramp up to $1.1 billion by 2021. In addition, the related – but more mature – market for smart automotive mirrors will reach $1.4 billion in 2019. NanoMarkets has been providing coverage of the smart windows market for six years and this report brings together the latest data from NanoMarkets’ ongoing forecasts in this sector. The report provides eight-year market forecasts in volume (square meters) and value ($ million) terms for electrochromic, photochromic, thermochromic, SPD and PDLC windows, along with projections for the smart auto mirror sector. In these forecasts, breakouts are provided for automotive (cars and trucks), public transport, aerospace, residential construction and commercial construction for each of the key smart windows technologies. We also assess the latest product market strategies of the key suppliers of smart windows. Some of the companies discussed in this report include: 3M, Asahi Glass, BASF, Chromogenics, DuPont, Eastman Chemical/Solutia, GE, Gentex, Guardian Industries, Hitachi, NSG, Pleotint, PPG, Research Frontiers, Sage, Saint-Gobain, Scienstry, Southwall, Solvay, Suntek, SWITCH Materials, Toray, US e-Chromics, and View. The smart windows sector will be dominated by active technologies over the next decade despite their higher cost. This is because of the ability of smart windows technologies to provide instantaneous response to user needs as natural light conditions change. Although passive smart windows technologies will continue to expand throughout the forecasting period covered by the report, NanoMarkets expects that they will never be much more than a niche. The report also claims that SPD and electrochromic smart windows will find a growing role in the automotive sector. Although primarily found in luxury cars today, NanoMarkets expects these high-tech windows to be much more widely used in the coming decade. They are no longer just a “cool” design feature but can lead to a significant lowering of fuel costs through the reduction in the use of air conditioning. Consequently, NanoMarkets believes that sales of smart windows to the car, truck and public transport sectors will leap from around $23 million today to $185 million by 2019. Electrochromic smart windows (including glass and film) will reach $622 million by 2019 making electrochromics the largest segment of the entire smart windows business. NanoMarkets believes this may have much to do with the fact that this sector can boast significant investment by influential firms such as Corning, GE and Saint-Gobain, and Seagate. Alternatives to the electrochromic materials platform do not have the same level of clout behind them. NanoMarkets tracks and analyzes emerging market opportunities in energy and electronics markets created by developments in advanced materials. The firm has published many reports on green building materials including smart coatings, building integrated photovoltaics (BIPV) and OLED lighting.